This item is one of the most recent additions to the trophy cabinet at St James Park. As most will know, the team embarked on a pre-season tour to Rio de Janeiro this summer to celebrate the birth of the Brazilian national football team. The reason for the invitation was thanks to City’s pivotal role in the first match, played at the end of the clubs 1914 tour of South America, where they competed in both Argentina and Brazil. Brazil at the time had agreed to play in the inaugural Julio Roca cup against Argentina, and felt that playing against a professional English side in the build-up would be the perfect way to prepare. Fortunately for them, and obliging ECFC were in the area, and on July 21 1914, the sides met at the Estadio de Laranjeiras to play in front of over 6,000 fans, who literally filled the ground to the roof tops. In a match which pitted English steel against Brazilian flair, the fledgling Selecao defeated Exeter by two goals to nil. 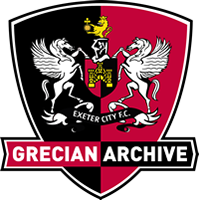 100 years on, the Grecians returned to the site of the original match, and while this time the crowd was much smaller, it included a dedicated army of travelling fans who saw the team hold the hosts to a goalless draw. This result, and a pre match agreement between the two parties, meant that Captain Scott Bennett had the honour of lifting this trophy, which as an object represents our 100 year association with the most decorated team in international football. The trophy has a name, which is written on it and which relates to a personal tribute by the donator of the trophy, Eric de Menezes, a much respected member of the Fluminense club and along with Ricardo Calcado, the official representative of ECFC in Brazil and a great friend and supporter of the Grecians.Eric and Ricardo were very much to do with ECFC being able to undertake the 2014 tour. There is an amusing, very personal and touching under story to the trophy but for now this will stay with the four people that know it!